This is the Shared Course Initiative(link is external), a three-way collaboration among Yale, Columbia, and Cornell that enables students on all three campuses to enroll in “live” courses for academic credit in languages ranging from Bosnian to Zulu. Launched in 2012 with initial funding from the Andrew W. Mellon Foundation, the initiative has flourished in the intervening years, growing to include 19 different languages and now reaching more than 571 students (as of spring 2018) across the partner universities. The impetus for the program was a combination of pedagogical invention, student need, and budgetary necessity, according to Nelleke Van Deusen-Scholl, director of Yale’s Center for Language Study(link is external). Yale students, whose educational and career paths take them all over the world both during and after their time on campus, “depend on our breadth and depth of language offerings,” Van Deusen-Scholl said. Faced with cutbacks to federal funding for language instruction, Yale, Columbia, and Cornell began a “conversation across institutional boundaries” and discovered their shared abiding commitment to languages as a cornerstone of 21st-century liberal arts education. “It became an innovative way to continue to offer a broad scope of language courses,” Van Deusen-Scholl explained. The offerings in the Shared Course Initiative can be summed up in two acronyms favored by those in the language-teaching profession: the LCTL (“licktle”), or less-commonly taught language, and the ANTL (“antle”), almost-never taught language. Often the student demand for an individual LCTL or ANTL on any one campus in a given semester is tiny. Yet for those students, the ability to acquire competency in the language may mean the difference between pursuing an international internship or field research or being forced to abandon those possibilities. At Yale, a university committed to fostering global leaders for all sectors of society(link is external), the initiative has played a crucial role in empowering students to connect across cultures. 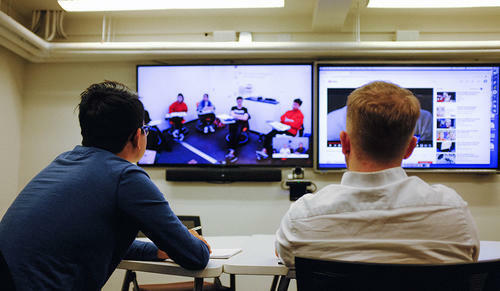 Students also receive a careful orientation to the course technology from the minute they first enter the classroom. “There is almost this ‘aha’ moment,” Van Deusen-Scholl said, “because they don’t know what to expect.” The spaces’ configuration — with large screens where students can see themselves as well as their remote peers — “creates a very immediate sense of being part of the same environment. You feel like you’re in the same room,” he added.